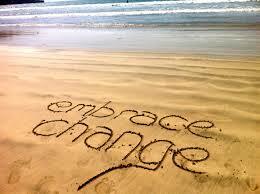 Is It Possible to Embrace Change? | UC Berkeley Student Affairs Community Blog! Each one of us has faced a difficult change in our lives. As the saying goes, the only constant thing in life is change. While we may cognitively know this, rationalize that it is a part of life–it can be, in many ways, scary due to the unknown, uncomfortable because of the unfamiliar, and exhausting because of changes from our past. These sentiments often do not shift much between our personal lives and work experiences. Undoubtedly, the campus continues to go through various changes, and our Division of Student Affairs is no exception. Whether it is organizational, structural or cultural, change stirs up emotions within people. Jason Clarke is the founder of Minds at Work in Australia, a group of professionals who are “experienced change agents providing practical guidance, skills and techniques to any group interested in Making Things Better.” How do we shift our own thinking and behaviors when it comes to change in our lives? Clarke spoke at a Tedx talk in Perth and explained how we can embrace change in the workplace, even when there may be resistance to it. Watch Jason Clarke’s Ted Talk! 1. “I’m too full of emotion and fears to think about it.” Clarke explains that if people had a way to audit their emotions regarding the change (the negative, interesting, to eventually, positive), they would be able to move through their various feelings. 2. “This has all come as a huge shock.” Communicate information and cascade it down within the organization in order for no one to feel isolated from the news, Clarke states. 3. “I’m scared of the transition, not the idea.” Life before a change is known, structured, proven, certain. Change can feel unknown, uncertain, freaky. Clarke argues that everyone is scared of something and that people may believe that this fear can lurk in this future change. However, he states that there are foreseeable, predictable things that we should name in order to ease people’s fears. No communication often leads to imagining the worst possible scenario. Things we could do before the change and here’s what we can still do; essentially, what won’t change. 5. “I don’t see how I fit into any of this.” He states that it is critical for people to have authorship versus ownership with the change–they have to feel the impact of designing it themselves. 6. “I feel like I have no say in what happens.” Clarke argues that one has either the choice to close one’s mind OR give change a fair chance that can possibly make a difference. 7. “I’m fed up with phony change.” Finally, Clarke’s last point is that people want genuine change, not a repackaged way of branding something that has not worked prior. Are people being invited in to make the future brighter? Or are they just being forced to make the change? He believes people want to make a difference, and will do so if they see the authentic, greater good for the future. Pingback: Through the Unknown, Comes Transparency | UC Berkeley Student Affairs: GO BIG!